Bronze stars mark the six locations where the SC State House was hit by artillery near the end of the Civil War. Image courtesy of SCPRT. From the Battle of Fort Sumter to Sherman’s March and Robert Smalls, South Carolina played a significant role in the American Civil War. Find out about Civil War soldiers from South Carolina, battlefields such as Fort Sumter, and more. Read about battles that took place in Charleston and see images taken by Civil War photographer Matthew Brady. Read editorials from newspapers in the late antebellum period. Andrew Magrath was a federal judge and later governor of South Carolina during the Civil War. This memorial recognizes the black Massachusetts Fifty-fourth Regiment that help assault Fort Wagner in Hilton Head. See the surgeon’s drawings and photograph of a surgery to repair the damage done to Edgar Cherry’s face by a bullet. Hear the recording of the recollections of a soldier in the First South Carolina Volunteers, the first slave regiment mustered into the service of the United States. Read about the recruitment of black soldiers, their white commanders, and a recruitment poster calling black men to military duty. See a newspaper account of the Battle of Fort Sumter from the Milwaukee Sentinel. Learn more about the morning of April 12, 1861. The H.L. Hunley was a submarine built by the Confederates to attach Navy ships in Charleston. She sank off the coast and was raised in 2000 for preservation. Read about how General William Tecumseh Sherman waged war through Georgia and then the Carolinas. See a map of the naval attack on Port Royal on November 7, 1861. Read these remembrances of a black woman who went with the First South Carolina Volunteers as a laundress, cleric, and nurse. Read recipes and descriptions of food cooked and eaten by civilians and soldiers during the Civil War. Use these recipes to create your own hardtack or Johnnie Cake. Listen to the Confederate song written to celebrate succession and titled after the flag South Carolina used after its succession in December 1860. Explore uniforms, photographs, swords, and other artifacts of the Civil War. What were the women doing while the men were away from home? The Ordinance of Secession was signed at a state convention in Charleston, stating that South Carolina repealed the United States Constitution and its amendments. This book shows forms and directions for military doctors in South Carolina. Read issues from the Union-held newspaper printed in Port Royal and Beaufort. Watch this video showing a Civil War pike ordered by Gov. Joe Brown of Georgia to arm soldiers. 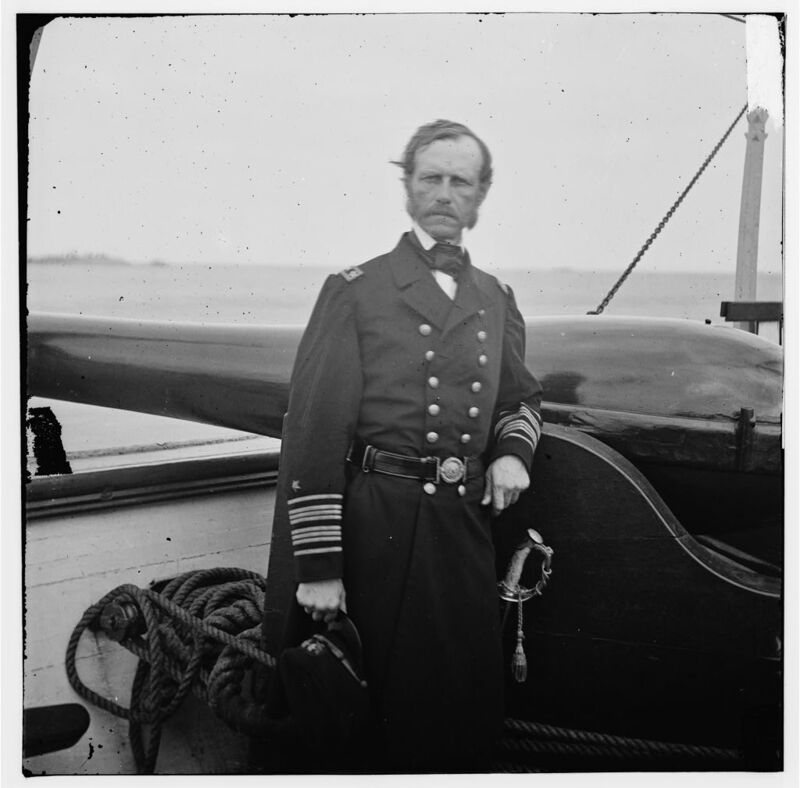 Charleston Harbor, S.C. Rear Admiral John A. Dahlgren standing by a 50-pounder Dahlgren gun on deck of U.S.S. Pawnee. Image from the Library of Congress Prints and Photographs Division. See stereographs of the interior of Fort Wagner, which covered the southern approach to the Charleston harbor. This photograph was perhaps taken at the conclusion of the battle for control of Morris Island. Notice the covered bodies in the foreground. Explore the pictures and drawings of Fort Sumter made during the Civil War.